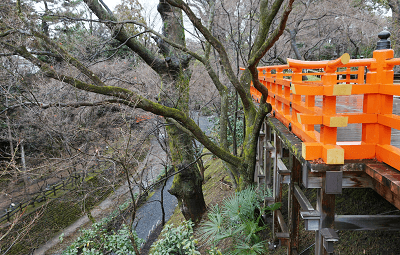 Kitano Tenmangu Shrine is located close to Kinkakuji Temple, in the northwest of the center of Kyoto. Kitano Tenmangu Shrine is the head shrine among approximately 12,000 Tenmangu Shrine and Tenjinsha shrines around the country (Kitano Tenmangu Shrine is like a headquarters and the other shrines are its branches). Its history has instigated much love for the shrine among many people, including the local inhabitants. Being the head shrine, its role also encompasses the continuation of tradition for posterity, including the strict observance of their old customs and ceremonies. It is in here -Japan's first shrine to have a human as the main enshrined deity- that Sugawara-no-Michizane became to be worshipped as the God of Learning due to his clear and sharp mind. Every year during the examination season between the end of the year and the beginning of the New Year, many students come from all over the country to visit the shrine and pray for success in their exams. Also, shrine festivals are held here on the 25th of every month, Sugawara-no-Michizane's birthday and death anniversary day. The 25th has such a deep connection with the shrine that major events tend to be held on this day of the month. 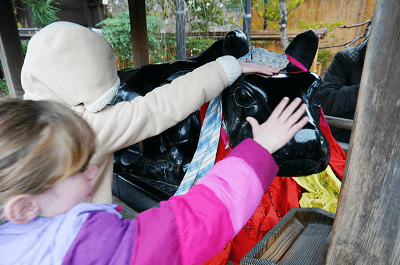 If you take a stroll around the grounds of Kitano Tenmangu Shrine, you will be sure to notice a great number of bull statues shown in various postures and sizes. The reason each statue looks as shiny as if it had just been polished is because people say that if you stroke a part of the bull, this will bring healing and strengthness to the corresponding part of your body. If your legs and body are starting to feel weary from all the traveling, make sure not to forget to make a wish to these cute-looking bulls. The other thing to do is making a wish with an Ema. Ema is translated into English as a votive tablet, but a direct translation of the word would be Picture of Horse. The Chinese character for horse was used in the name because since the olden times in Japan, the horse has been regarded as a sacred creature used as the mode of transport of the gods. The tablet, Picture of Horse has been named after this belief of the horse and people write their wishes on small wooden tablets to be sent to the gods. However, what is interesting about Kitano Tenmangu Shrine is that what is drawn on this tablet is actually the picture of a bull. If you are about to take an important exam in the near future, why not write your wish on this slightly unusual tablet depicting a picture of a bull (not a horse), and hang it up in the grounds of the shrine? On the grounds of Kitano Tenmangu Shrine there is a plum garden featuring about 1,500 plum trees of roughly 50 different varieties standing close together. Plum trees start to flower every year from around the beginning of February, and the best time to see them is around the end of the month. Many plum flowers feature deeper colors than cherry flowers, with a wide variety of colors including pink, red, and yellow. Also, plum flowers produce a lovely smell, so one of the best things about these little flowers is to put your face close to them to enjoy their delicately pleasant aroma. Sugawara-no-Michizane, the deity of this shrine, once recited the following song as he thought about his cherished plum flowers, at the time when it was decided that he would be relegated from the capital to a far-away land due to a stroke of misfortune. make sure to open up your sweet-smelling flowers. please never forget to flower in the spring." 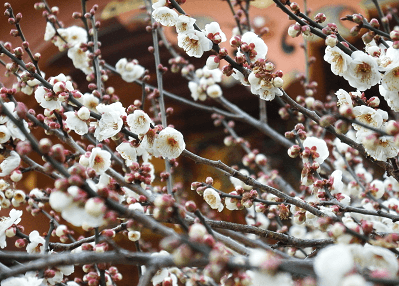 As you walk around the plum garden at Kitano Tenmangu Shrine, try remembering this song and see if you can feel what Sugawara-no-Michizane felt at the time. Toyotomi Hideyoshi was a famous samurai from the civil war era that united the whole of Japan. He loved organizing events. In 1587, in Kitano Tenmangu Shrine, he gathered together from all over Kyoto a large number of people acquainted with the tea ceremony. He held a giant tea ceremony with approximately 1,000 people, in order to boast his great authority. In this ceremony, the people showcased their own style of tea ceremony using their most precious tea utensils. A nodate tea ceremony, in other words an open-air tea ceremony, was also held for the first time, which enjoyed great success. 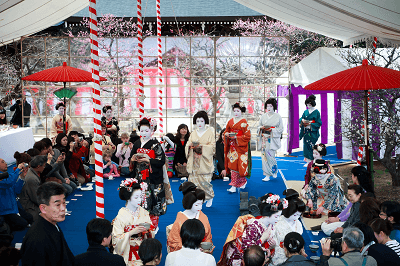 In line with this historical fact, nowadays every year on February 25th, under the plum trees at the best time for viewing their flower blossoms, the nodate tea ceremony is held with Maiko and Geiko performers from the Kamishichiken area. This splendid event is a true cultural highlight. As well being a man of a rare elegance, Hideyoshi was also one of the best samurai in the history of Japan. As part of his reconstruction plans for Kyoto, which became a desolate city after the many years of wars and disturbances, he ordered the construction of a giant moat and fort called Odoi (measuring 3.6m to 18m in width, with walls up to 36m in height and 22.5km in length) in order to protect the town areas from invasion by foreign enemies, and to protect the city from flood disasters. After its completion, the fear of invasion gradually diminished, turning the Odoi into a useless structure. Although the Odoi was built to surround and protect the city, only very few of its sections remain to this day. Kitano Tenmangu Shrine has one of those remaining sections, which is very popular nowadays as a famous location for viewing Japanese maple trees. 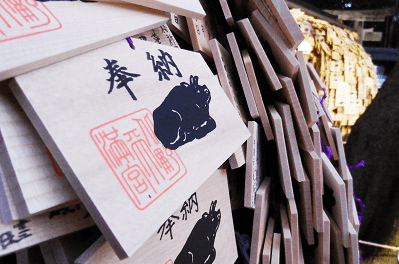 Part 1What's Kitano Tenmangu like?